Now . . . that bridge in the background has not been moved to the North Country, has it? And have the folks at Brooklyn Bridge Park –the section south of the Bridge–finally been persuaded to have freighters incorporated into the design? And is this foreground schooner really named John A. Noble? Will the captain and crew please identify themselves? Answers to the above questions are (in order) no, no, YES, and maybe. 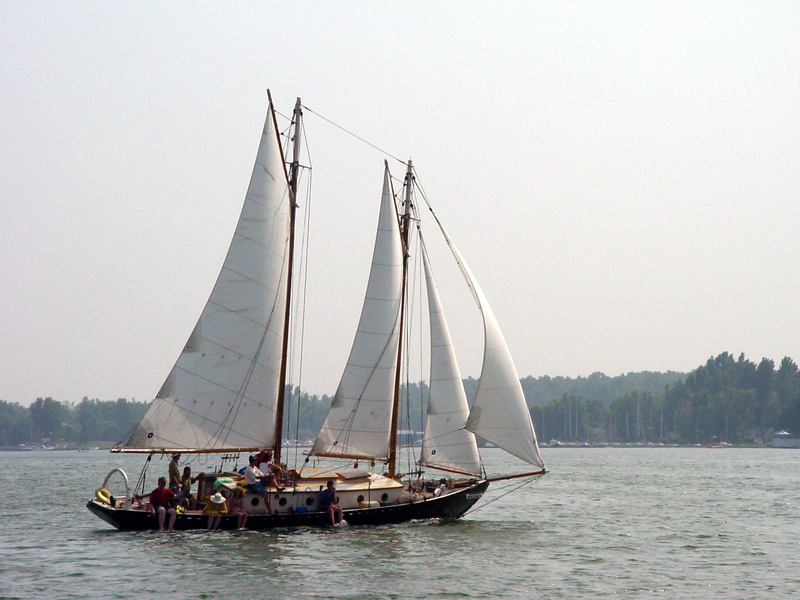 The foto below is the same vessel, now named Sara B, and now a denizen of Lake Ontario. Sara B‘s very complete and illustrated log (2004–current . . . hours of pleasure await at this link) can be found here, a story that bears some resemblance to one told by Farley Mowatt. In the background are Lake Ontario’s Chimney Bluffs. Sara B was built in the 1950s (can be more specific now) near Lunenburg, Nova Scotia. 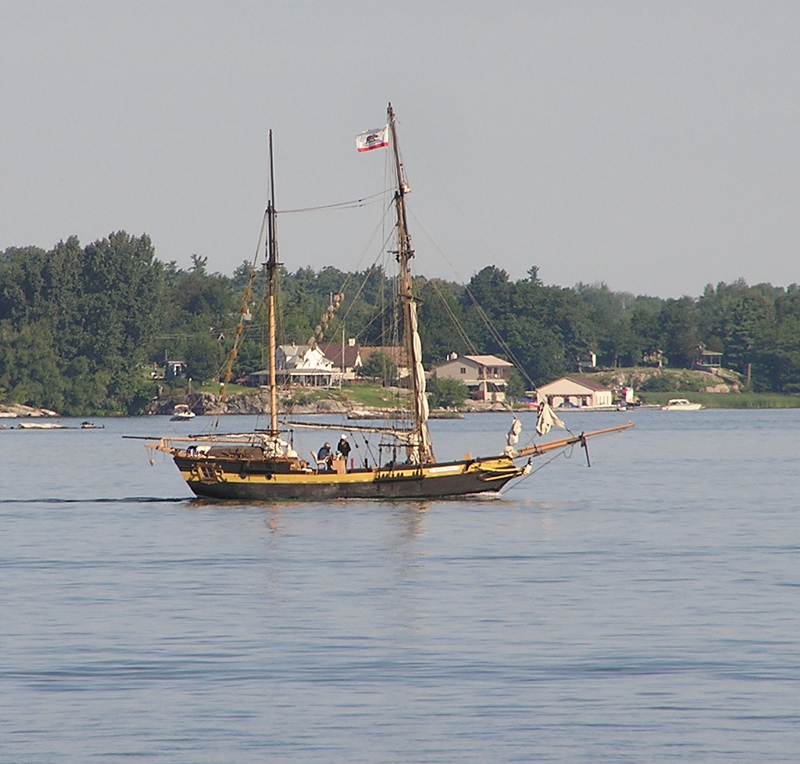 She then traveled up the St Lawrence and through Champlain Lake and Canal, ultimately to the sixth boro, which explains the lead foto. The log begins with her purchase here and voyage up to Ontario. 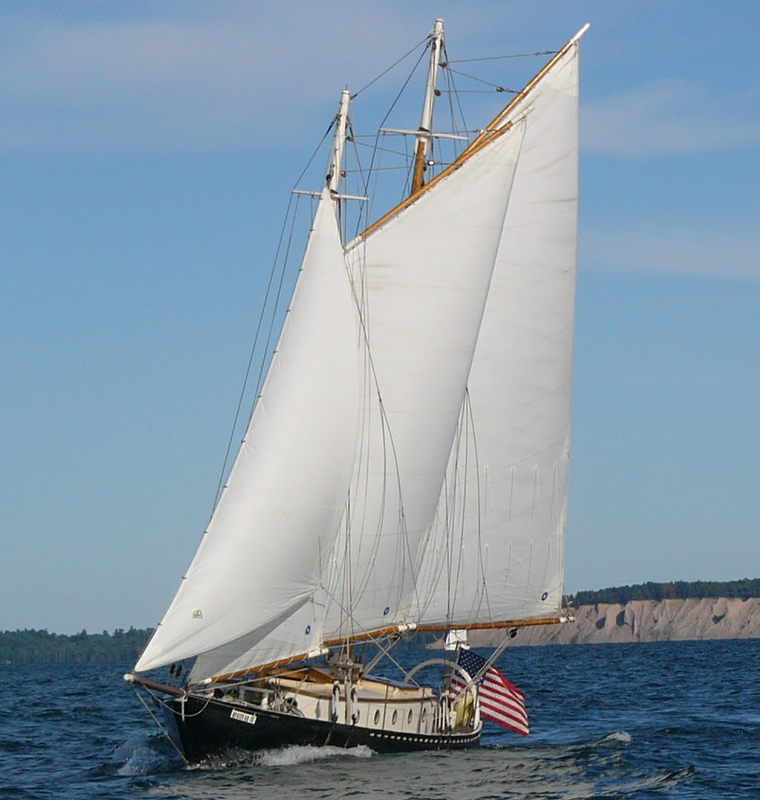 Below is the pinky schooner La Revenante (Ghost) (ex-Amanda, Buccaneer)built in Massachusetts in 1969. I spotted her twice: once near Ogdensberg and then here near Alexandria Bay. “La Revenant” belong to charles Baudelaire. 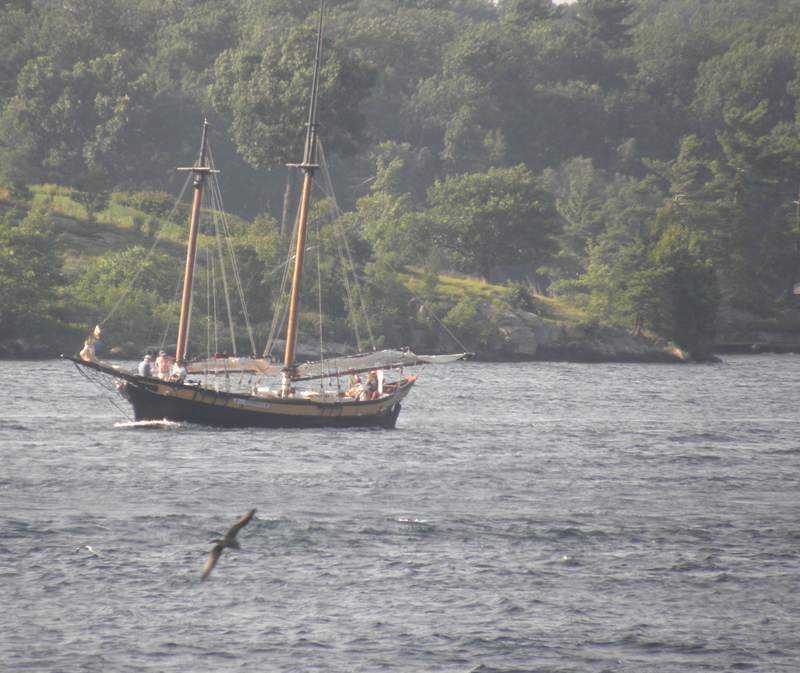 Mentioned in the Sara B log is this vessel (foto from 2008) called Royaliste, technically a gaff-rigged topsail ketch. I saw Sara B in a barn last week south of Oswego, where she’s undergoing a refit. Check out refit log here. Anyone tell New York stories about Sara B or John A. Noble . . . I’d love to hear them. Last two fotos here are mine; the others are attributed in her log. Sara B‘s log is kept by Susan Peterson Gateley, whose other writing can be found here. Yes, the B&W photo is of John A. Noble when I had her from 1980 – 1987. John Noble was a local artist and a good friend of mine. His lithographs recorded the working harbor and ships of all kinds. I’m in the stern in the cockpit. The rest are my good friends – behind the main is Bill Condrin. Behind the main mast, barely visible, is Lou Tapp. The white shirt belongs to Gerry Weinstein and the fellow leaning against the starboard fore shrouds is Steve Giese. One the foredeck, back to camera, is Eddie Elias. 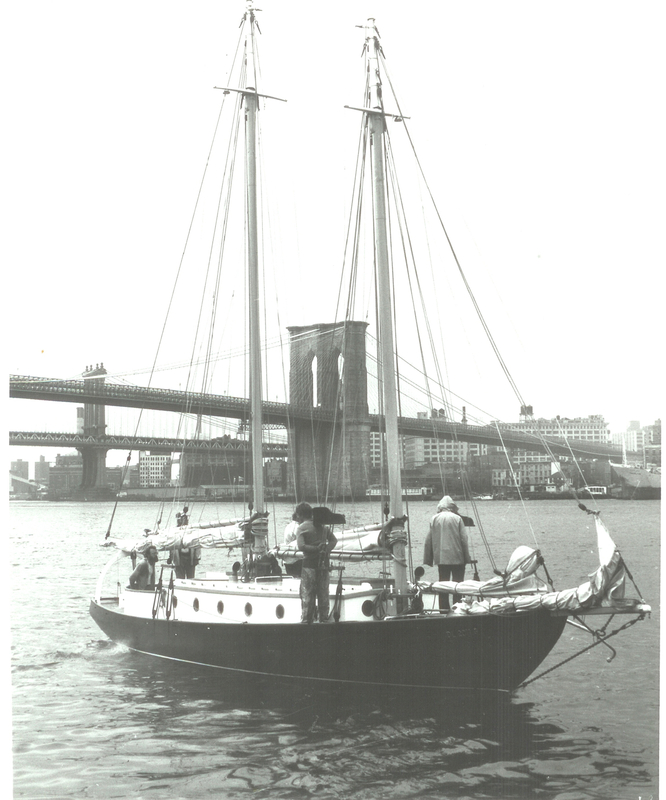 The photographer is unknown to me but the picture was taken at the start of the 1981 schooner race held annually by the South Street Seaport Museum. Of the six in the picture, two of us are left. She’s a good boat and sailer. A nice single-hander and, like most boats, has her quirks. 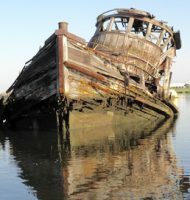 By sheer accident, I came across the boat after a typo sent the computer to the Sara B site. I made the trip to Oswego to see the boat after many, many years. I often thought of what became of her and hoped that she didn’t wind up on a mud flat somewhere. The boat couldn’t have a better home and those two people have done right by her. Personally, I will be eternally grateful. charlie–i had dinner with susan and chris–sara b’s current owners–last week. it was a jolly time up by lake ontarioish town of newark, ny.